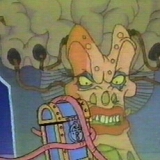 Mother Brain, voiced by Levi Stubbs, is an evil brain in a bottle. She banished King Charles to the Mirror Warp and constantly tries to overthrow Princess Lana. She is one bad brain.